Disclosure: Affiliate links included below. 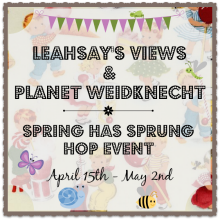 This giveaway hop runs from April 15 through May 2 and all the bloggers listed below are hosting their own giveaways worth at least $25. You can hop to each blog via the list and enter to win every single prize. Good luck! Now that spring has sprung, I've been working on my backyard garden. We've replaced our fence, planted fruit trees, onions, garlic, and cilantro. We're in the process of building raised garden beds so we can plant even more fruits and vegetables. Although we're investing a lot of money up front, we're excited for the harvest that we'll have for many years to come. Did you know Amazon sells lots of great garden products? Check out these great finds! 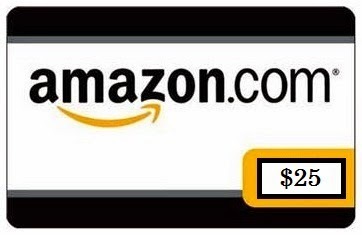 I'm giving away a $25 Amazon Gift Card! Giveaway is open worldwide and will be delivered electronically. My spring gardening needs are gloves, a hat and a knee pad! I need a few new hand tools for my garden. I must have left mine out last year. Wow. This is wonderful. Mothers day coming and I can't wait for a gift for my Mother. I need some nice flowers and vines for my containers. I do not have a spring garden. My Spring Gardening needs are some new flowers and plants to put in bare spots outside! I actually need some new gardening tools. I could really use a new pair of gardening gloves and new flowers to plant outside on our front walkway area. My garden needs all the dead stuff removed. We also need to replace the top soil and add new plants. I need garden fencing and raised bed. I don't yet have a garden. We moved to Northern Idaho from Arizona in December. So, I am looking forward to figuring out what I can grow and get into it. I'm really excited! have given up. Can always use garden gloves, solar lights, painted rocks. thanks. My spring garden desperately needs some weed removal, I hate them and I fight to keep the out all season long. My spring garden needs sunshine and desperately needs to be tilled. Our garden needs a new hose and some new sprinklers. I just moved, and need to figure out where to garden at my new home. I also need to get some plants. My spring garden needs a new bird feeder. My spring garden needs some strawberry plants. Veggie plants and some flowers. Weeding! Lol. It got a bit out of hand last fall and I'm just getting it back in shape for planting. Part of it is planted..some tomatoes and my strawberries. I live in MN and we have only a summer growing season. Our garden needs better soil - way too sandy. General yard work, weeds, trimming and edging. We need some seeds and new soil. I need flowers of course and soil. I also need a pad to kneel on in my garden because my knees hurt. I need a whole bunch of items, some gloves, weed killer, gardening tools. My garden needs sun. I have too much shade to grow much. My spring garden needs new soil and plants. I can't wait to start growing tomatoes! My Spring Garden needs some tomato plants! I need soil and veggie plants! My spring garden needs land and be left alone. My spring garden needs are getting seeds and start planting, woo hoo. I need some seeds and to prepare the soil. It needs water...we're in a drought here! My Spring garden needs someone who doesn't kill the plants. My spring garden needs hands to organize it. My husband and i are senior citizens who are not able to tend our little garden. My garden needs rain! We have been in short supply the last few months. Well, I actually need a garden first. Right now I need it to stop raining so I can start the process of planting!! Weather is terrible. My spring garden needs flowers. Leave a comment below and tell me what your spring garden needs. My garden news a new fence on one side. My garden needs top soil and a new garden hose. tomatoes! thanks for the giveaway! my email is in my blogger profile. I don't have a garden. :( We live in an apartment building. my garden needs a gardener that actually has a green thumb lol. :).It also needs flowers and plants,and fertilizer! I need my husband to plant my spring garden! we need to plant our herbs! love fresh garden tomatoes with fresh basil and a little balsamic reduction!! My spring garden needs a bird feeder! My Spring garden needs to exist, LOL! I live in an apartment and I don't have one. We have started a few seeds inside. but we need new soil, more plants and lots of mulch. My garden needs more roses and less slugs. My spring garden needs flowers. I have not started it yet. I live in an apt. so there's no gardening for me. My spring garden needs compost and fertilizer. I have lots of spring garden needs! I have a flower garden I want to put in, and I want to have a vegetable garden for the first time ever! My garden needs everything as I have not been out there for a long time.....there's a large wasp nest there and they are angry ones! My spring garden is about finished, but I do need some basil, rosemary and parsley. I forgot about the herbs! I need some more plant soil, pots, and flowers. I don't garden anymore since I became disabled. We do, however, buy potted flowered plants and put them in the front of the house & garage. My garden needs more sun. I've put some pots in the front yard for a tiny garden but I wish I could have a big vegetable garden in the back yard. We need some colorful flowers! I will buy some more Milkweed to plant in my Monarch garden we need to help save the Monarchs ! I'd like to do some flowers this year. I haven't done a garden in a long time. We need to pull out the weeds and put in the border and plant some more flowers in our front flower bed and in our vegetable garden, we need to pull the old plants and till the soil and get it ready for planting. I'd like some pots for growing herbs. I could use some good potting soil and mulch. I need a good weeded and lots of peat moss! I need vegetable, herb and flower plants. I also have to pick up some more sunflower seeds. I have a ditch that runs along one side of my yard, the mammoth sunflowers are so much nicer to look at, and the birds appreciate them too. I don't have a garden, but I want to start a veggie garden this year!! I need to add more soil to my above ground garden boxes. I need some pretty, new clay pots! Our Winter here on the East coast was so cold, that most of my pots cracked and broke! We even lost our glass patio table to the below zero temps! If I won, I would buy a bird feeder. That would look great in our flower garden. My spring garden needs some pretty flowers. My spring garden needs for my mini donkey to NOT EAT IT! I don't exactly have a green thumb, so I was really super-duper excited that the jasmine I planted last spring was climbing the trellis and BLOOMING!! Then the donkey ate it, roots and all. Now I have browning tendrils climbing out of nowhere. I don't know why, but I bought a gnome statue! I don't have a garden to put this in. Maybe I will put it in between the bushes in front. My garden needs...well, everything! We just moved into a new house and there's not much of a garden yet. Lots of work to be done! We need to get get more mulch for our front yard. As for our garden, we need to replace a hose in our water fountain, plant new herbs/spices, and re-pot our money trees and mango trees. I don't know what more I can comment with - I don't have a garden anymore. I would love to, but I a disabled & cannot do half the things I used to. Finish laying my patio,then get grass seed down,lots of grass seed! I need some more carrot seeds, some plants, and some bigger pots to plant the plants in! I really need to fix my garden soon. I have to plant more flowers. I need a worm farm and a nicer composter for my garden. Also some moree tomatoe cages would be great. I need a book on gardening because I've never done it before! I rent so I have no gardening needs...would love to grow tomatoes! My daughter has the green thumb. Her garden is beautiful & healthy looking. Maybe she can use a better fence around it. My garden needs sun! We have been getting rain and dark cold weather no sun! My garden needs a cleanup! It's been raining so I haven't been able to do it, but today looks like a great day! I follow you as pqcolletti on pinterest, instagram, and gmail. Right now I need more pots. I am just about to start my first garden so I need all the supplies! I do already have a few packs of bulbs to plant that I picked up yesterday. My spring garden needs a good clean up before we start fresh. Mine is a yard and a garden! We are still looking for a house, so I am gardenless this year right now. I hate it! IF I had a garden, I would definitely plant a couple of vegetables & tomatoes. I remember taking tomatoes from the vine at the farm not to far from my house & eating it right after picking it! It was so juicy & good!! My Spring garden needs fertilizer, herbs, more veggies and perennial flowers! My Spring garden needs new flowers. I dug up the wildflowers I've had planted for years as I am ready for something new.